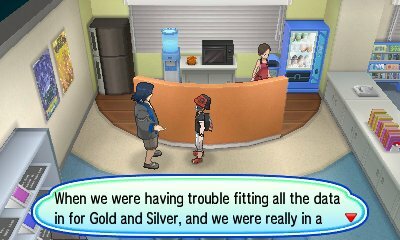 Pokémon Ultra Sun & Ultra Moon, through Pokémon Bank has access to Pokémon from all 7 Generations of video games, from Red & Green all the way up to Pokémon Ultra Sun & Ultra Moon. To get Generations 1 & 2, you need the Virtual Console versions of the game and these Pokémon are signified by a GameBoy icon, but these Virtual Console Pokémon unlock more than just themselves. 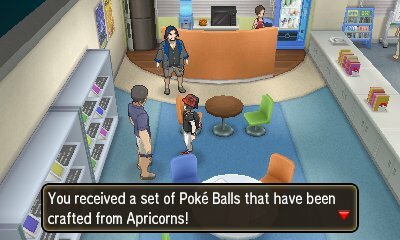 In the GAME FREAK building in Heahea City, if you speak to the guy who asks which colour you prefer with a Pokémon from Gold & Silver on your team, you will receive a set of Apricorn Balls from Pokémon Gold & Silver, they are the Fast Ball, Friend Ball, Level Ball, Lure Ball, Heavy Ball & Love Ball. You can only do this once per game, regardless of how many Pokémon you transfer to Ultra Sun & Ultra Moon. In the GAME FREAK building in Heahea City, if you speak to Morimoto with a Pokémon from one of the Virtual Console games on your team, he will give out specific statements about the history of those games. These statements given depend upon the game that the transferred Pokémon is from and there are three that cycle through from it. You know Mankey, right? I'm actually the one who came up with it! The boss told me to make a Pokémon with a bit of this and a bit of that, and that's what I drew! I'm pretty fond of it myself! Tauros used to be real strong, huh? I was the one who thought up that one. But Blizzard was a bit too strong, eh? You know Diglett, right? It’s actually basically just a character that I had made up when I was a little kid. I even drew up a flip-book featuring it then! You know Shuckle, right? I was the one who thought it up. Bet you were surprised to find out that giving a Shuckle a Berry to hold in Gold and Silver would turn it into a Berry Juice after battling! You know Piloswine? I designed that Pokémon. I felt like I had to get all 12 animals in the Chinese zodiac together, you know? The Time Capsule was pretty awesome, right? Boy, it still sounds like a dream... To be able to go back and forth in time, popping back to the past or into the future as you’d like! But making it work was a real pain. I loved the Bug-Catching Contest! Did you know that you can win it even by catching a Caterpie or Metapod? It’s true! Boy, when we were told halfway through development to make Kanto, too... I thought I might just expire on the spot! But I’m glad we made it that way.